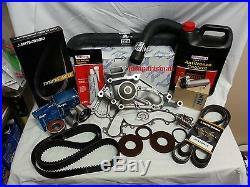 TOYOTA Tundra 4.7L V8 Aisin Water Pump & Timing Belt Kit W/ Hose & Thermostat. AISIN WATER PUMP w/GASKET WPT800. GATES RADIATOR UPPER & LOWER HOSES 21660 + 23018. THIS KIT IS INTENDED FOR TOYOTA TUNDRA ALSO FITS. BUT MUST LEAVE YEAR MAKE MODEL OF VEHICLE TO GET CORRECT DRIVE BELT HOSES CAM SEAL AND HYDRAULIC TENSIONER. 1998 LEXUS GS400 4.0L V8. 1998 LEXUS LS400 4.0L V8. 1998 LEXUS LX470 4.7L V8. 1998 LEXUS SC400 4.0L V8. 1998 TOYOTA LANDCRUISER 4.7L V8. 1999 LEXUS GS400 4.0L V8. 1999 LEXUS LS400 4.0L V8. 1999 LEXUS LX470 4.7L V8. 1999 LEXUS SC400 4.0L V8. 1999 TOYOTA LANDCRUISER 4.7L V8. 2000 LEXUS GS400 4.0L V8. 2000 LEXUS LS400 4.0L V8. 2000 LEXUS LX470 4.7L V8. 2000 LEXUS SC400 4.0L V8. 2000 TOYOTA LANDCRUISER 4.7L V8. 2000 TOYOTA TUNDRA 4.7L V8. 2001 LEXUS GS430 4.3L V8. 2001 LEXUS LS430 4.3L V8. 2001 LEXUS LX470 4.7L V8. 2001 TOYOTA LANDCRUISER 4.7L V8. 2001 TOYOTA SEQUOIA 4.7L V8. 2001 TOYOTA TUNDRA 4.7L V8. 2002 LEXUS GS430 4.3L V8. 2002 LEXUS LS430 4.3L V8. 2002 LEXUS LX470 4.7L V8. 2002 LEXUS SC430 4.3L V8. 2002 TOYOTA LANDCRUISER 4.7L V8. 2002 TOYOTA SEQUOIA 4.7L V8. 2002 TOYOTA TUNDRA 4.7L V8. 2003 LEXUS GS430 4.3L V8. 2003 LEXUS GX470 4.7L V8. 2003 LEXUS LS430 4.3L V8. 2003 LEXUS LX470 4.7L V8. 2003 LEXUS SC430 4.3L V8. 2003 TOYOTA 4RUNNER 4.7L V8. 2003 TOYOTA LANDCRUISER 4.7L V8. 2003 TOYOTA SEQUOIA 4.7L V8. 2003 TOYOTA TUNDRA 4.7L V8. 2004 LEXUS GS430 4.3L V8. 2004 LEXUS GX470 4.7L V8. 2004 LEXUS LS430 4.3L V8. 2004 LEXUS LX470 4.7L V8. 2004 LEXUS SC430 4.3L V8. 2004 TOYOTA 4RUNNER 4.7L V8. 2004 TOYOTA LANDCRUISER 4.7L V8. 2004 TOYOTA SEQUOIA 4.7L V8. 2004 TOYOTA TUNDRA 4.7L V8. 2005 LEXUS GS430 4.3L V8. 2005 LEXUS GX470 4.7L V8. 2005 LEXUS LS430 4.3L V8. 2005 LEXUS LX470 4.7L V8. 2005 LEXUS SC430 4.3L V8. 2005 TOYOTA 4RUNNER 4.7L V8. 2005 TOYOTA LANDCRUISER 4.7L V8. 2005 TOYOTA SEQUOIA 4.7L V8. 2005 TOYOTA TUNDRA 4.7L V8. 2006 LEXUS GS430 4.3L V8. 2006 LEXUS GX470 4.7L V8. 2006 LEXUS LS430 4.3L V8. 2006 LEXUS LX470 4.7L V8. 2006 LEXUS SC430 4.3L V8. 2006 TOYOTA 4RUNNER 4.7L V8. 2006 TOYOTA LANDCRUISER 4.7L V8. 2006 TOYOTA SEQUOIA 4.7L V8. 2006 TOYOTA TUNDRA 4.7L V8. 2007 LEXUS GS430 4.3L V8. 2007 LEXUS GX470 4.7L V8. 2007 LEXUS LX470 4.7L V8. 2007 LEXUS SC430 4.3L V8. 2007 TOYOTA 4RUNNER 4.7L V8. 2007 TOYOTA LANDCRUISER 4.7L V8. 2007 TOYOTA SEQUOIA 4.7L V8. 2007 TOYOTA TUNDRA 4.7L V8. 2008 LEXUS GX470 4.7L V8. 2008 LEXUS SC430 4.3L V8. 2008 TOYOTA 4RUNNER 4.7L V8. 2008 TOYOTA SEQUOIA 4.7L V8. 2008 TOYOTA TUNDRA 4.7L V8. 2009 LEXUS GX470 4.7L V8. 2009 LEXUS SC430 4.3L V8. 2009 TOYOTA 4RUNNER 4.7L V8. 2009 TOYOTA SEQUOIA 4.7L V8. 2009 TOYOTA TUNDRA 4.7L V8. 2010 LEXUS SC430 4.3L V8. Sellers: Add a FREE map to your listings. The item "TOYOTA Tundra 4.7L V8 Aisin Water Pump & Timing Belt Kit With Hose & Thermostat" is in sale since Wednesday, February 13, 2013. This item is in the category "eBay Motors\Parts & Accessories\Car & Truck Parts\Engines & Components\Timing Components". The seller is "jdmpartsman714" and is located in Costa Mesa, California. This item can be shipped to United States, to Canada, to United Kingdom, DK, RO, SK, BG, CZ, FI, HU, LV, LT, MT, EE, to Australia, GR, PT, CY, SI, to Japan, to China, SE, KR, ID, to Taiwan, ZA, TH, to Belgium, to France, to Hong Kong, to Ireland, to Netherlands, PL, to Spain, to Italy, to Germany, to Austria, RU, IL, to Mexico, to New Zealand, PH, SG, to Switzerland, NO, SA, UA, AE, QA, KW, BH, HR, MY, TR, BR, CL, CO, CR, PA, TT, GT, HN, JM.